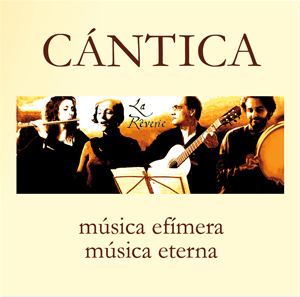 This album by La Rêverie, entitled CANTICA, is an inusual mixture of early and Spanish music. Most pieces include spurious parts – as it were. They are our own compositions and arrangements, whose purpose is to comment on the pieces from the present time, holding a conversation with that old music. The members of La Reverie – musicians with long artistic careers – have performed with renowned and diverse music groups and institutions, such as the Symphonic Orchestra of Malaga’s Higher Conservatory of Music (Spain), Inocu (Italy), El Sombrero del Alquimista (Spain) and El Tercer Ojo (Bolivia). Their music has been heard in various cities and festivals, such as the International Music Festival in Cadaqués (Girona), the Salón de los Espejos (Hall of Mirrors, the elegant performance venue in Malaga’s Town Hall) or Granada’s prestigious International Festival of Music and Dance. Manuel Esteban, guitar, arrangements and composition. La Rêverie – CANTICA CUARTETO performing the poem ‘Baile‘ (Dance) written by Federico García Lorca :: Composition: Manuel Esteban. Voice: Yolanda Campos; Flute: Inma Gómez; Guitar: Manuel Esteban; Percussion:Ángel Martín. Registered at Los Acústicos del Rey Chico, Granada, April 2018. La Rêverie – CANTICA CUARTETO performs the poem Menos tu vientre written by Miguel Hernández en hommage to Serrat :: Composition of Joan Manuel Serrat.